In the Western Premier League on Saturday, Stafforce Dumfries were involved in another exciting last over finish in their five wicket win at Kelburne. In the first innings Kelburne kept going from a position of 84 for 6 wickets to reach a final total of 161 all out. Opening bowler Niall Alexander took four wickets with three from Josh Geary and two to spinner Jerry Goodin. In reply Dumfries had two important partnerships between Josh Geary and Alan Davidson and then Connor Jones. After contributions from skipper Robert McBride and Marcus Richardson, Geary and Davidson shared a sixty run partnership from 63 for 3 before Davidson fell for 27. Then Jones joined Geary in a sixth wicket partnership and they took Dumfries to needing two runs off the final over. Jones hit the winning runs with two balls left to finish on 20 not out and the Cairndale Dumfries Man of the Match, Josh Geary, was unbeaten with a match winning score of 60 not out. In the Western Premier Reserve League, Dumfries 2nds, Nunholm, faced a big total at home as Whitehaugh scored 313 for 8 wickets, of which Dave Strachan took three wickets and Andy Reed two. Then the ETP Electrical Nunholm Man of Match Cammie Telfer batted well for a top score of 74 as Nunholm reached a final total of 172 all out for a win to the visitors. In the Western Union Cup on Sunday, Dumfries beat GHK at home at Nunholm in a rain reduced match to reach the semi-final. Dumfries scored 182 for 3 off 30 overs with a classy innings of 55 from the D&G Fire Protection Dumfries Man of the Match, Chris McBride and 69 not out by Josh Geary. GHK finished short in a revised run chase in reaching 121 for 5 chasing 140 in 20 overs. Chris McCutcheon and Connor Jones each took two wickets. Chris McBride was also in action during the week contributing runs for Durham U17s in their drawn 3-day match against Lancashire and in the Durham Academy win on Saturday in the North-East Premier league. This Saturday, in the Western Premier League, Stafforce Dumfries are at home at the Galloway Industrial Nunholm ground against East Kilbride and Dumfries seconds, Nunholm are away at Torrance House in the Western Premier Reserve League. On Sunday afternoon Dumfries play Aberdeenshire in the Scottish Murgitroyd T20 semi-final at Shawholm in Glasgow. Dumfries Women play Stirling in the Scottish Cup this weekend and Nunholm is the venue for Scotland U15s in their ECB County Cup match against Derbyshire. In the Western Premier League on Saturday, Stafforce Dumfries won their home match against Prestwick in an exciting last over finish. Prestwick set a first innings score of 172 all out with the Dumfries bowlers doing well to restrict the total after the visitors were 100 for 2. Chris McCutcheon took four important mid-innings wickets whilst Scott Beveridge had two top order dismissals and Josh Geary also took two to finish the innings. Fraser MacDonald top scored for Prestwick with 47. Dumfries were in similar position in the second innings at 100 for 3 but both Robert McBride for 28 and Josh Geary for 47 were out soon afterwards. Thereafter it was a necessary 48 run seventh wicket partnership between Alan Davidson, with 28, and Connor Jones that kept the target in sight. However two wickets in the penultimate over left six to win off the last and now with just two wickets left. Nevertheless Ronan Dunbar hit his one delivery for a winning four, with three balls left, to cheers from the Nunholm Ladies Day spectators. The Annandale Insurance Dumfries Man of the Match, Connor Jones, finished on 25 not out after successfully judging the run chase. In the Western Premier Reserve League a one hundred and seventy run opening partnership for St Ninians, and a Carlyle century, set them up for their win against Nunholm. The Silver Fern Horticultural Nunholm Person of the Match, Trevor Newport, took two wickets in their total of 268 for 6. Then after a good Nunholm start first change bowler Stafford proceeded to take seven wickets in just eight overs as the visitors were all out for sixty eight. Dumfries team that won the Borders T20 Final against Kelso. On Sunday in the Murgitroyd Borders T20 Final, Dumfries beat Kelso by 22 runs at St Boswells. Dumfries scored eighty nine for five batting first with runs shared amongst the batsmen. A good bowling and fielding effort then reduced Kelso to 28 for 6 and they were all out for 67 in the penultimate over. Davie Davidson and Trevor Newport each took three wickets; Scott Beveridge took two plus a diving run-out which was assisted by keeper Adam Elliot who also claimed two good stumpings. That win earned Dumfries a place in the Scottish Murgitroyd T20 Semi-final scheduled for the end of the month. This Saturday, in the Western Premier League, Stafforce Dumfries play away at Kelburne and Dumfries seconds, Nunholm are at home at the Galloway Industrial Nunholm ground against Whitehaugh in the Western Premier Reserve League. 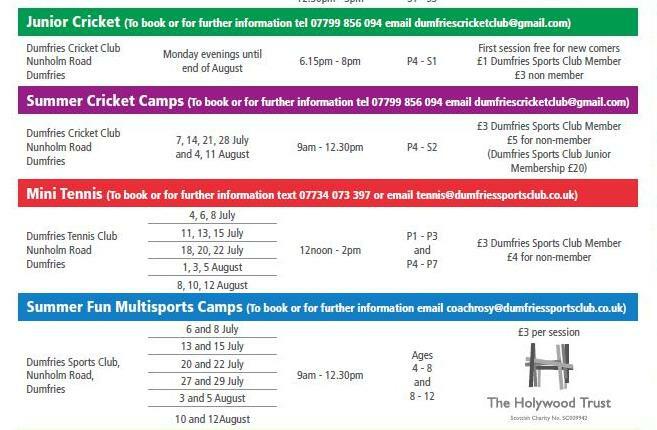 Summer Holiday Cricket Camps are taking place at Dumfries Sports Club at Nunholm on Thursday mornings (9-12:30) throughout the holidays. These are suitable for boys and girls (P4-S2). Costs are £3 (for club members), or £5 a session, with beginners very welcome to come and have some fun with a new sport. The Club can be contacted about these, and the weekly Monday evening junior sessions, and about Senior, Women’s, and Junior cricket on dumfriescricketclub@gmail.com, or 07799 856094. See www.dumfriescricketclub.co.uk, or find the Club on social media, facebook.com/dumfriescricketclub), or twitter.com/dumfriescricket). Last week Cricket Scotland hosted the winners from their `Love Cricket #choosecricket` Video Competition at the Scotland v Afghanistan ODI at the Grange in Edinburgh. One of the five winners was Dumfries Cricket Club and for their involvement in the Dumfries entry on social media Amanda Creedon-Bass and Brogan Dean were presented with a certificate on the outfield after the first innings along with the Cricket Factory equipment prize won for the Club. Amanda said “It was an enjoyable day. Cricket Scotland looked after us and it was a bonus to come back with coaching equipment for the Club to use in schools and at Nunholm”. The competition was held to celebrate the ICC Best Overall Development Programme Award that Cricket Scotland received last month with Cricket Scotland deciding to reinvest the award into equipment for schools and clubs to win as part of this competition. There are plenty of junior activities on at Nunholm over the holidays with tennis, cricket and multi-sport summer camps. Get in touch. Details can be found below. Dumfries player Chris McBride made his debut during the week for Durham 2nd XI in their three day 2xd XI Championship match against Derbyshire. The Durham side sealed a five wicket victory on the final morning with sixteen year-old McBride, batting comfortably at four, sharing in the morning partnerships to take the game away from Derbyshire. His was the last wicket to fall having helped to add some seventy runs with those partnerships to take his side to the brink of victory. Chris, who has also made appearances for Durham U17s this season, is one of the young players this season invited into the county’s Durham Academy, used by Durham to develop their young cricketers and to help them make their mark in the county set up. In the Western Premier League on Saturday, a crucial century third-wicket partnership involving the top scorers for league leaders Ferguslie, overseas bat Hannes Venter who hit 94 and Michael English with 47, took the game away from Dumfries at Nunholm. The Dumfries bowlers stuck to their task, with Josh Geary taking three wickets, but were faced with a challenging final total of 244 for 7. After early wickets to Carruthers and late wickets to Ramsaroop, Dumfries could only reach 130 in reply despite a not out half-century from the Lever Photography Dumfries Man of the Match, Alan Davidson, supported by runs from Drew Dawson and Chris McCutcheon. In the Western Premiership Reserve League, Nunholm faced a difficult target of 270 set by Ferguslie 2nds at Meikleriggs, with former Dumfries player David Sturgeon hitting a century for the home side. In the second innings Nunholm batted overs but were finally all out for sixty one for a convincing home side win. Mark Irwin with an all-round effort was the R. Barbour & Sons Man of the Match for Nunholm. This Saturday, in the Western Premier League, Stafforce Dumfries are away at Ayr and Dumfries seconds, Nunholm, play at home at the Galloway Industrial Nunholm ground against Cambusdoon in the Western Premier Reserve League. Junior Cricket: Dumfries U12s had an enjoyable match at Langholm with wickets to Luke McBurnie and Sean Thornely-Kyle, and accurate opening bowling from Katy Anderson and Aiden Goodin helping to keep the Langholm score down to 77, for whom Brady Wilson hit the top score. Good batting from Max Corbett-Byers, James Little, and Tom Currie then saw Dumfries home in a competitive match after a good team effort.